Both Augmented Reality and Virtual Reality have entirely changed the way we perceive the world around us. The twin technologies have become the latest buzzwords in the media and technology enthusiasts all around the world are raving about them. But the one thing that most of us are really unsure about is what exactly distinguishes one from the other. To clarify your confusion, here is a discussion about the major differences between AR and VR. In essence virtual reality is a computer generated recreation or simulation of real life scenarios or environments. In other words, Virtual reality is the artificial creation of a virtual world with which the user can interact in real time. So basically, VR world is developed in a way that the user is unable to tell the difference between what is real and what has been artificially create by the computer. The VR incorporates technologies that stimulate both hearing and vision of the user to create an immersive experience which he/she feels a part of. You can experience VR by simply wearing VR enabled headsets such as the Oculus by Facebook. The VR is typically developed with the help of specialty coding languages such as the Virtual Reality Modeling Language or VRML that can effectively replicate real environments and allow user interaction. The VR technology is extensively used in enhancing the user experience of 3D video games, movies and providing a more life-like experience for training pilots in flight simulators. Augmented reality on the other hand is a sort of merger of virtual and real life to create a more meaningful situation that is easy to understand and interact with. To put it in other words, AR employs computer generated images within computer and mobile applications to create a sort of blend between the contents of the virtual and the real world. 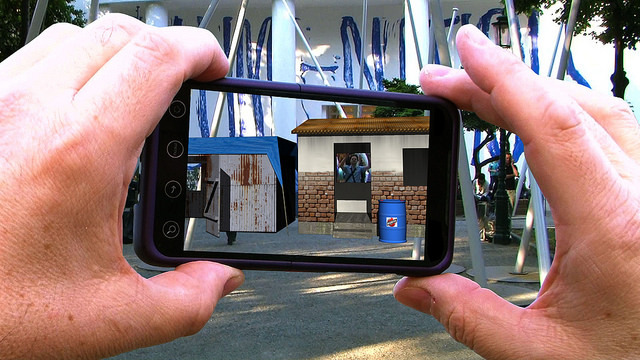 That being said, with AR, the users are able to differentiate between the real and virtual world and interact with the computer generated contents in reality. In essence, Augmented Reality is way ahead of Virtual Reality in the sense that it has already found extensive application in the mainstream world and is extensively being used in our everyday life. The one major difference that distinguishes AR from VR is that while VR is primarily a virtual recreation of a real life scenario, the AR offers virtual components as a overlay atop the real world.